Want to be a content marketing master? 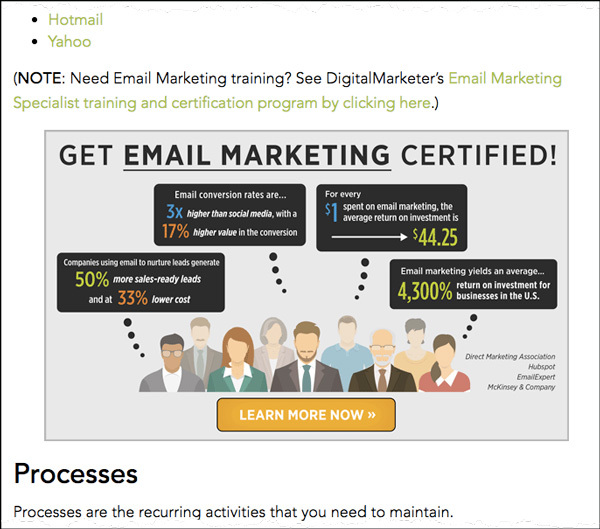 Get our step-by-step plan for turning content into free, organic traffic and get certified as a Content Marketing Specialist. Let’s fix that, shall we? 🙂 Once you fix these issues (especially #2 and #4), you’ll not only start getting subscribers—but you’ll be adding them FAST! A blog is a channel. It’s a marketing channel, not a product or a service people can buy. In order to pick up subscribers, your blog needs to make a relevant offer to your target audience. Your blog is a way to make people aware of the product(s) or service(s) your business offers. Think about what you can offer people, and use your blog as a means to make your offer to your target audience by including a call-to-action (CTA) in the blog’s body. So, what do you sell? Through products and services, you’ll acquire leads/subscribers. If you want subscribers, you need to make a Lead Magnet Offer—an irresistible bribe offering a specific chunk of value to a prospect in exchange for their contact information. You’re all familiar with Lead Magnets. They’re the pop-ups and the sidebars of websites you visit that ask for your contact information. The problem with this opt-in box is that there is no SPECIFIC, COMPELLING offer. What does it mean that I will get exclusive articles, downloadable eBooks, and geeky trivia? I don’t see how these offers solve a problem for me. If you want subscribers, then your blog NEEDS a Lead Magnet that calls out to your audience and offers them specific value if they opt-in. When you tell someone you will solve a specific problem they have in exchange for their email, then you have a compelling reason for them to subscribe. Solving this problem can be as simple as giving them quality, relevant information that educates them—as a free Lead Magnet. Once you’ve gathered their contact information, you can make your subscribers relevant offers to products/services you sell. So, in that sense, subscribers and leads are the same thing. At DigitalMarketer, we have Lead Magnets for almost every product we sell. For example, we created a Lead Magnet for our blog called the Ultimate Social Media Swipe File. We offer this Lead Magnet to people visiting blog articles about social media. This page converts over 50% of the people who visit it into leads/subscribers. The Ultimate Social Media Swipe File Lead Magnet has generated ~350,000 leads through email, search, social media, and paid traffic over the last two years. So you can see a Lead Magnet that offers specific value is super powerful. Create a compelling Lead Magnet with a specific, compelling offer and watch your subscribers soar! Once a person has opted in to your Lead Magnet, make them a low dollar offer known as a Tripwire Offer. And once these new customers have made their first purchase with you, they’re likely to buy from you again—provided they had a good experience and got value from their purchase. Let’s look at the math behind how a Tripwire offer will liquidate the cost of acquiring new subscribers and allow you to generate subscribers at scale. In other words, here is how you start getting 100 subscribers a day instead of 100 subscribers a month. There is a HUGE difference in conversion rate between traffic that is driven to a homepage or blog post and traffic that is driven to a squeeze page. Squeeze pages are far more effective at converting than your homepage. What does far more effective mean? We’re talking as low as 1% conversion rate to a Lead Magnet on a homepage or blog post sidebar and north of 60% conversion rate on a dedicated landing page. Homepages and blog post pages are distracting. There are SO MANY different places a person can click on your homepage, from your About Us section to Products Page. People will get “shiny object syndrome” and become less likely to opt-in. 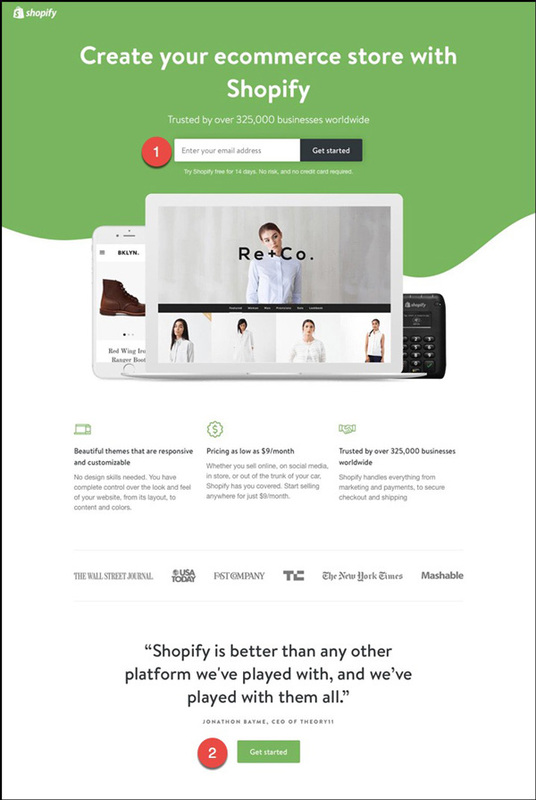 There are TWELVE different places a visitor can click on this homepage—and that’s just above the fold. 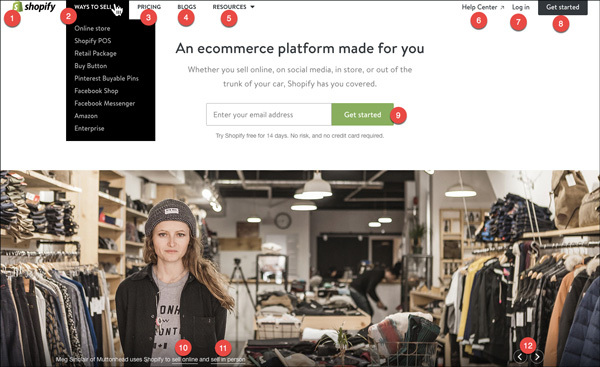 In fact, there are 82 (yes, I counted) points a visitor can click and interact with Shopify’s homepage. This could easily lead to their email opt-in getting lost or forgotten by a user. Your blog post can sidetrack a lead just as easily as your homepage. There’s content to read, links to other resources to click, videos and images to consume, etc. All of this can distract a prospect from opting in. But a dedicated squeeze page has far fewer distractions to cause a lead to wander. A squeeze page only has two choices: opt-in or leave. Now, I’m not advocating that you eliminate sidebar banner opt-ins on your homepage or blog post pages and that you exclusively use squeeze pages. 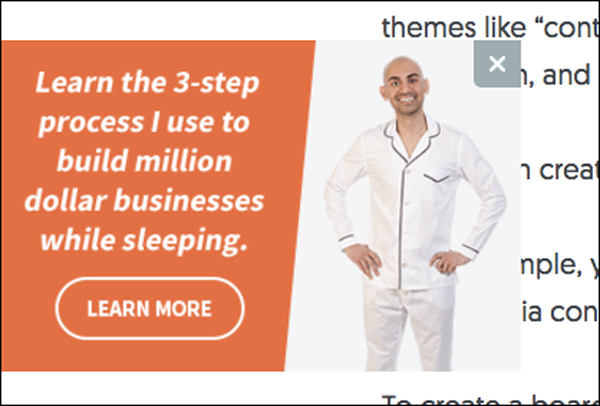 There’s no reason not to have a sidebar opt-in, but it will not convert at the same success rate as a dedicated squeeze page. Not even close. …and sending it to your blog or your landing pages. Once you’ve built Lead Magnets, Tripwire Offers, and landing pages, you want to buy traffic and drive it directly to your blog, or to one of your offer landing pages. You will gain more leads, at a far quicker rate, when you buy traffic, allowing you to scale. And finally, when people come to your site and consume your content they are effectively raising their hand and saying they’re interested in this topic. Through the contact information you’ve gathered from your Lead Magnets and Tripwire Offers, people who have shown interest in your blog content could be retargeted. Retargeting can be very effective because it keeps your brand top of mind and reminds people of the quality content and offers you have. If you have a Lead Magnet, a Tripwire, and a landing page, and you are scaling up by buying traffic, start looking at retargeting to really ramp up the number of subscribers that you’re getting to your blog. Start by addressing Mistake #1, Thinking Your Blog is a Business, and work your way down the list. Correcting these six mistakes will help you generate more leads, subscribers, and ultimately, revenue.